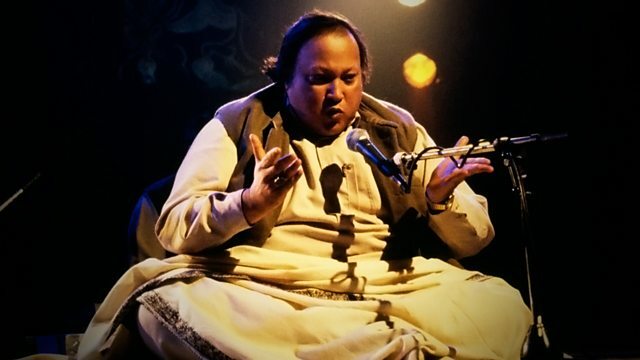 Nitin Sawhney explores the work of Qawwali singer Nusrat Fateh Ali Khan, dubbed the 'Elvis of the East'. Nitin Sawhney presents an introduction to his vocal hero, Nusrat Fateh Ali Khan, who was once dubbed the "Elvis of the East". The legendary Qawwali singer's music came over to the UK from Pakistan in the seventies, thanks to the OSA label in Birmingham and the singer entranced Britain's Asian community. Peter Gabriel booked Nusrat for his Womad World Music Festival and subsequently signed him to his Real World label, opening up a whole new audience through his film soundtrack work like The Last Temptation Of Christ and Dead Man Walking. Plus, collaborations with Massive Attack and Pearl Jam's Eddie Vedder. He died at the age of 48 leaving a legacy of over 125 albums. His vocals are kept alive by remixing and new productions by the likes of Gaudi, Asian Dub Foundation as well as Nitin Sawhney himself. His life and legacy is charted here with contributions from Peter Gabriel, his nephew Rahat Fateh Ali Khan, Gaudi, actor Michael Sheen, singer Rumer, DJ's Andy Kershaw and Nihal, and producer Jonathan Elias amongst others. Music from and inspired by the motion picture Dead Man Walking. Duma Dum Mast Kalander - Single. Vird Karo Allah Allah, Vol. 30. Echos du Paradis: Sufi Soul. Nusrat Unheard - 30 Rare Recordings.